I have to admit that I’ve got a real soft spot for the work of recently deceased commercial pitchman Billy Mays. Yes, he was loud. Very loud. Yes, he was often pretty grating and when I dozed in front of the TV on Sunday afternoons, his informercials (I called them Screamavision) always woke me up. But he grew on me, especially once he did his ESPN commercials where he poked fun at his persona. That’s why I’m wearing blue for Billy today. He had his flaws, but apparently his pitch style works, because he sold everything from cleaning products to life insurance successfully. 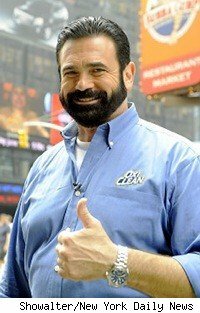 The glimpse at the Billy behind the Billy Mays persona the world saw on his excellent show Pitchmen revealed him to be a thoughtful and decent dude, and made him a whole lot more likable. I had fun with his persona, but I know he did too. I’m going to miss the guy. He wasn’t as aggressive or ironic as the ShamWow guy Vince Offer, but he did the job and he did it in such a way that you knew it was Billy Mays even before you saw that famous beard. He seemed like a good dude who died way too soon.